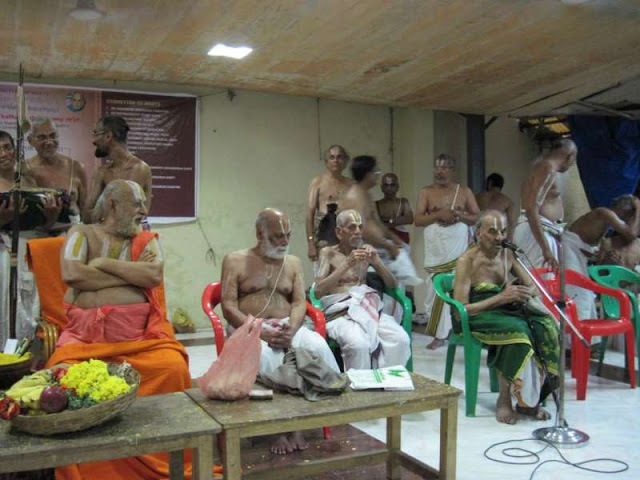 20th Jan 2013 provided a podium for many Sri Vaishnavaite scholars conglomerating in one place to honour a Vidwan..
Sanskrit is an amazingly rich language, acclaimed as ‘deva basha’, profoundly rich in literature encompassing poetry and drama. The grammar of Panini is acclaimed to be the best and described as one of the greatest productions of the human mind. There are only a few who have mastery over the language. 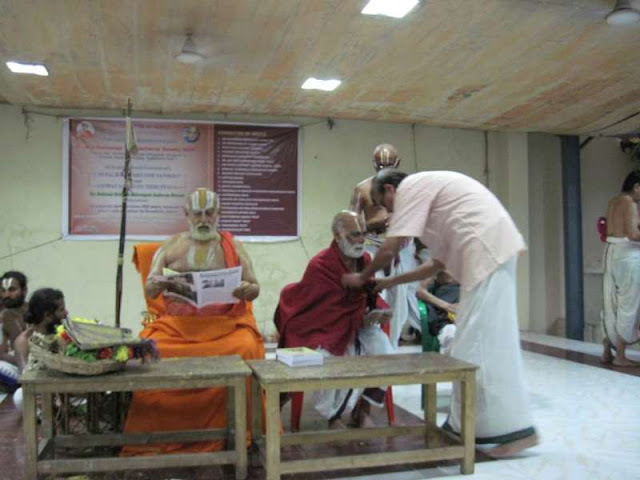 There are many Srivaishnavaite scholars who have proficiency in Sanskrit and Tamil. 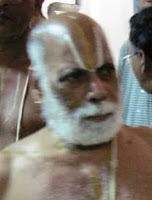 There are many who serve the Lord in various Divyadesams and other temples of pre-eminence. Most of them are well-educated, have mastered religious scriptures, recite Sri Nalayira Divyaprabandham of Azhwars and more… there are some villages which have regularly had such scholars churned out from its land. Navalpakkam is another small village located in Vandavasi, famous for Sanskrit scholars and others who have been serving God. Sri U.Ve N S Ramanuja Thatacharyar Swami is one such legend. This Swami was born in 1928, mastered Tharkam, Vyakarnam, Meemamsa and Vedantam; passed Tamil Vidwan; Hindi; obtained doctorate degree (Vidya Varidhi) from Kasi Sampoornananda Samskrta University and has done splendid academic work. This learned Scholar well versed in Sanskrit, has been recipient of many many awards…………. the recent one has put International acclaim. Sure you have heard of ‘Chevalie award’ ~ more so after it was given to Tamil cine actor Sivaji Ganesan. The Legion of Honour, or in full the National Order of the Legion of Honour is a French order established by Napoleon Bonaparte in 1802. The Order is the highest decoration in France and Chevalier [Knight] is its first degree. Understand that amongst other things the prescribed eligibility is : minimum 20 years of public service or 25 years of professional activity, and "eminent merits"
Professor Navalpakkam Ramanuja Tatacharya has been recognished for his scholarly achievements. He was conferred the prestigious title of ‘Chevalier de la Légion d’Honneur’ from the Government of France in a ceremony held at the French Consulate in Pondicherry on 12 July 2012, in the presence of his Excellency, Mr. François Richier, Ambassador of France in India. Many organizations have since honoured him for being the recipient of ‘Chevalie’ award. 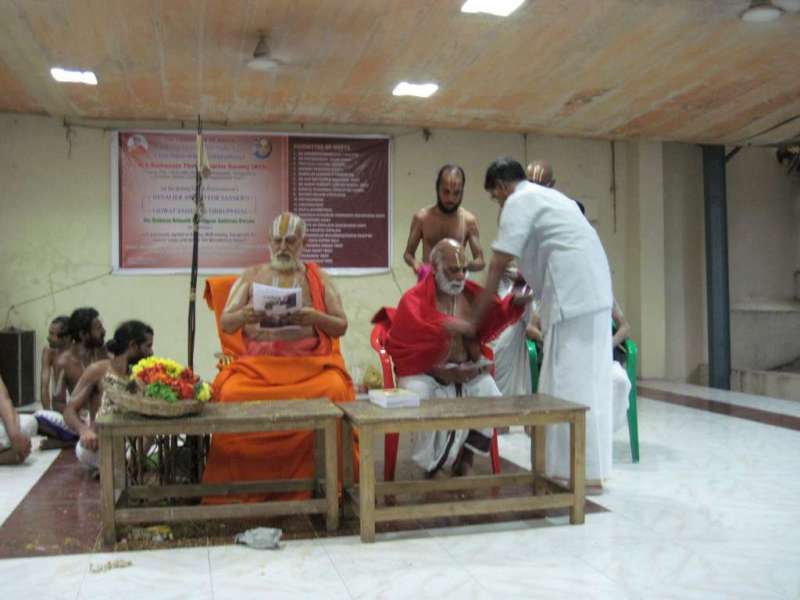 This Sunday, 20th Jan 2013, at Bharathiyar Illam, Yogakshema Trust, a body that propagates the Vedic principles organized felicitations to NSR Swami; there was a Thiruppavai Sathas too. His Holiness Andavan Swami was present. Dr VV Ramanujam on stage.